The next featured writer in the Library's "Our Picks" author series is Peter Robinson, author of the Inspector Banks mystery series. Robinson just published his 25th book in the acclaimed series. He introduced Inspector Alan Banks in his first novel in 1987. Since then, the Inspector Banks books have been translated into 19 languages and have won several awards. Britain's Left Bank Pictures and ITV also turned the books into an award-winning TV series, which later aired on PBS. 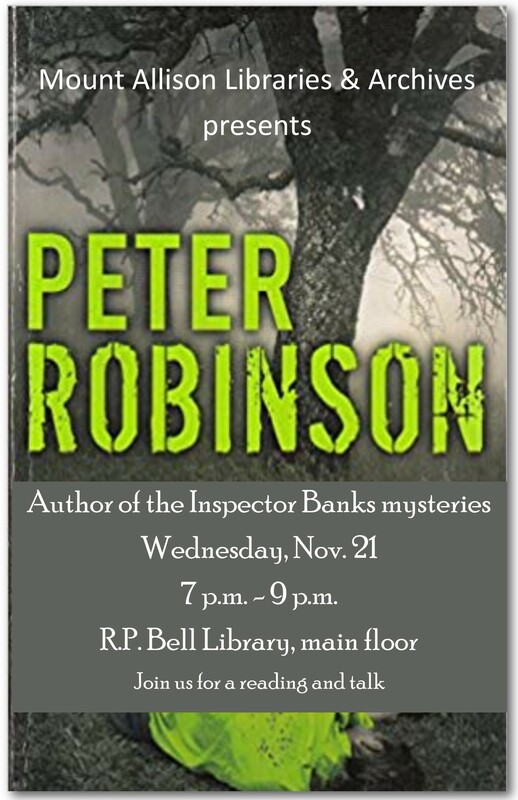 Peter Robinson will speak on the main floor of the Library at 7 p.m. on Wednesday, Nov. 21. Tidewater Books will be present for a book-signing after the talk, which will take roughly an hour. This event is free and all are welcome. Mount Allison's R.P. Bell Library is located at 49 York St., Sackville.